India’s largest two-wheeler maker, Hero Honda Motors Ltd, said net profit for the three months ended September declined 5.4% over the same period a year ago, its fifth straight quarterly decline, as higher lending rates forced customers to stay away and fierce competition prevented the company from raising prices. Analysts expect better results in the third quarter as sales rise in the festival season, new models are introduced and interest rates soften. Hero Honda’s revenue rose about 4.4% to Rs2,391 crore in the quarter. In the same period of the previous year, revenue was Rs2,289.4 crore. After years of double-digit growth rates, sales in the world’s second largest two-wheeler market fell 10% in the quarter to 1.72 million units as lending rates, which have risen by as much as five percentage points in the last year, drove away customers. About 60% of two-wheelers are bought on credit in India. “There was a general slackness in demand due to high interest rates," said K.K. Mittal, a fund manager with Escorts Asset Management Ltd. “But, sales are going to go up since there are more choices for consumers." Hero Honda and rivals such as Bajaj Auto Ltd have introduced new models for the festival season which started last week. Rising expenses for both raw material and marketing, however, are squeezing the operating margins of two-wheeler companies. Hero Honda’s operating margins fell about 32 basis points to 12.39% in the second quarter from a year ago, as prices of raw materials such as steel rose. Operating margins measure how much profit is left after deducting the basic expenses of running a business. Still, it’s better than what analysts had expected. “The realizations are higher since the sales mix has improved," said Huzaifa A. Suratwala, senior analyst at Networth Stock Broking Ltd. Hero Honda sold more of its higher engine capacity bikes such as the Super Splendor and CBZ Xtreme. 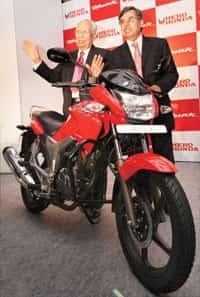 Most of its recent launches have been higher-margin premium bikes such as the Hunk, introduced on Wednesday. “A lot will depend on interest rate movement and commodity prices," said Pawan Munjal, managing director, Hero Honda, in a statement. “There has also been some respite in input costs during the last quarter," he added. At the same time, a declining market has restricted companies from raising prices, and instead dole out rebates and discounts. Hero Honda’s latest offer is a Rs2,020 rebate on its entry-level bike, CD Deluxe. Shares of Hero Honda fell 1.5% to Rs724.6 each in a weak market. The resultswere announced after the market closed.